When you get off the train take the underpass and follow the exit direction "Marghera". At the end of the underpass you will enter into Via Ulloa. At the end of Via Ulloa there is a roundabout. When you get there you have to turn right, Hotel Colombo is only a few meters from the roundabout, in Viale Paolucci nr. 5 (5 minutes walking). 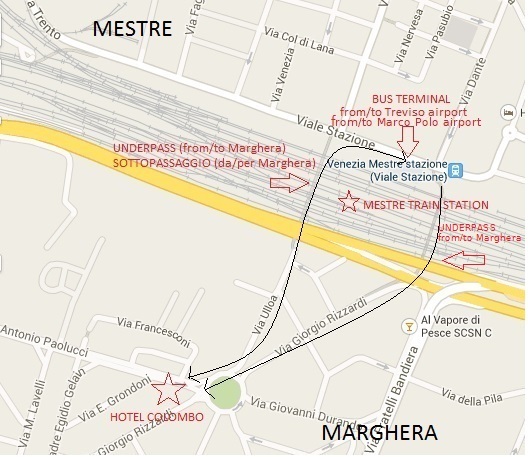 Please take Bus number 15 and get off at Mestre Train station. When you get off the bus you have to go to the underpass and take direction Marghera. At the end of the underpass you will enter into Via Ulloa. At the end of Via Ulloa there is a roundabout. When you get there you have to turn right, we are only a few meters from the roundabout, in Viale Paolucci nr 5 (7 minutes walking).